SpongeBob Found to Impair Preschoolers' Thinking &amp;mdash; Should You Be Worried? Rot your kids’ brains right there in their heads will he. 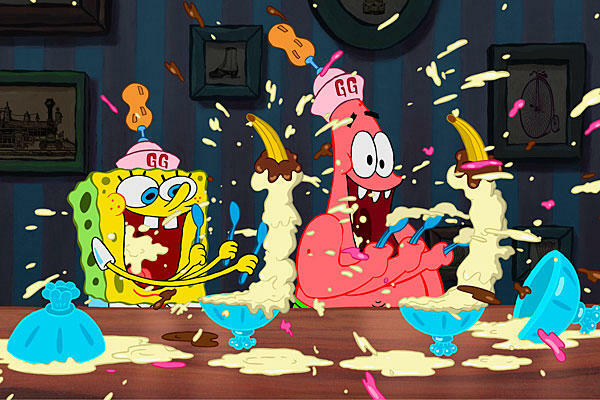 There’s a lot of hullabaloo on the web today about a newly-published study out of the University of Virginia that shows that preschoolers who watched SpongeBob SquarePants had increased difficulty performing tasks requiring focus and self-control. The study draws the conclusion that watching a fast-paced TV show negatively affects kids’ cognitive functioning for a short time after watching it. The scientists conducting the study, which was published in the journal Pediatrics, took a group of 60 four-year-olds, mostly from white, middle-class families, and randomly separated the kids into three groups: one which watched a part of a SpongeBob episode, one which watched a similar amount of a Caillou episode, and one which simply did some free-drawing and watched no TV. After that phase was over, they gave the children a set of tasks to do which required what’s called “executive function,” a term which refers to a set of skills related to goal-directed behavior — including attention, self-regulation, problem-solving, and ability to deal with delayed gratification. They consistently found that the kids who had watched SpongeBob did significantly worse at the tasks than the kids in either of the other groups. Now, I’m no developmental psychologist, but several things about the conclusion being drawn here leap out at me. First, this was a group of four-year-olds, who are not the target audience for SpongeBob, and with good reason — the humor in SpongeBob is largely based in irony and sarcasm, two concepts that few kids under the age of six are likely to grasp. Second, SpongeBob, while the most popular cartoon show on TV, is not representative of all cartoon shows aimed at kids six and up, or even of all such shows that are fast-paced. I would love to see the study retried using Phineas and Ferb in place of SpongeBob, as they’re about equally fast-paced, but P&F operates on several levels of humor while SpongeBob aims squarely for its target demographic and doesn’t care if anyone outside that demographic enjoys the show. And lastly, the study only looked at short-term effects — is it necessarily worth worrying about if your four-year-old can’t do well at mentally-challenging tasks immediately after watching a goofy TV show? If watching SpongeBob has long-term effects on executive function, do a study that demonstrates that and then I’ll really be concerned about it. More to the point, the study doesn’t delve into the question of why the show had that effect. Maybe it was that the kids had zoned out a bit because they couldn’t process what was going on in the show, or maybe it was that they were absorbing it all but needed more time to process what they’d seen after the show was over, or maybe it was something else entirely. The bottom line is that (much as I don’t personally care for SpongeBob) this study really offers no new good reason for prohibiting your kids from watching it.